Adapts conventional engine stand to all 2 rotor engines for easier assembly and dis-assembly or storage. NOW with longer slots to fit more engine stands! This is the factory exhaust gasket for the 2nd Generation "FC" RX-7 TurboII (Series 4 and 5). It is an expensive metal-clad, single-piece gasket. If you want something more affordable, check out our line of graphite exhaust gaskets. Stock Mazda 86-88 (Series 4) Turbo "FC" Manifold to Turbo Exhaust Gasket. Item pictured is Graphite alternative material. This is the metal OEM gasket. This is the OEM metal Turbo to Downpipe Gasket for 86-91 "FC" RX-7 Turbo engines. Check out our aftermarket high-temp graphite gaskets as an alternative. Main Bearing for 1993-1995 3rd gen FD RX-7 13B-REW engine. This is the multi-window version of the main bearing, only used on the 3rd gen RX-7 FDs. Two required per 2-rotor engine. This is the 3rd gen RX-7 FD (93-95) pull-style clutch release collar, aka "thowout bearing". It is the only recommended part for this application. 1 piece Solid Dowel Pin, pick your engine and choice of 1 or 2 pins. Take advantage of Pair pricing! FD Idler pulley conversion kit. Includes all necessary parts to install your pulley in the "BT" kit location for added clearance. Bearing Press Tool Kit for 12A/13B/20B/26B Replace your main or rotor bearings yourself with this professional quality nickel plated kit priced at 1/2 of the Mazda tools!!! 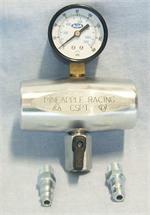 ***HOLIDAY SPECIAL*** Oil Regulator test tool for safely and accurately modifying and testing of the rear oil pressure regulator for all years.